Two Training Opportunitites — One Workshop. 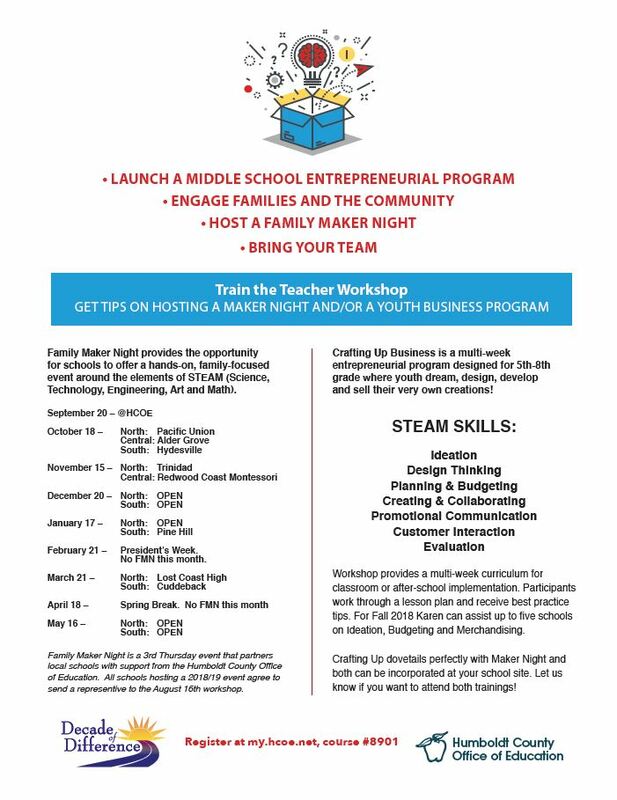 One workshop involves training to learn about bringing a Family Maker Night event to your school/organization. Family Maker Night (FMN) 2018 kicks off Sept. 20th in the HCOE Sequoia Conference Room. Workshop participants will be asked to volunteer at this event. FMNs are scheduled for the 3rd Thursday of the month during the school year and we are looking for HOST sites for 2018/19. Workshop participants do not need to commit to hosting a FMN for 2018/19, just an interest in learning and being involved. Schools who wish to host an FMN in 2018/19 need to send a representative to this event. Schools who hosted FMN last year are not required to attend, but are encouraged to do so as sharing their expertise and networking is very valuable. The other workshop involves training to bring an entrepreneurial program to your school/organization. This six to eight week program, called Crafting Up Business, is designed for 5th-8th grade students as a classroom or after school care series. Participants will receive a binder of lesson plans from ideation, planning and budgeting, making, promotion and customer service, and geared towards a selling event. Who: Bring yourself or your team. Suggested participants include educators and community members interested in STEAM applied to the real world. 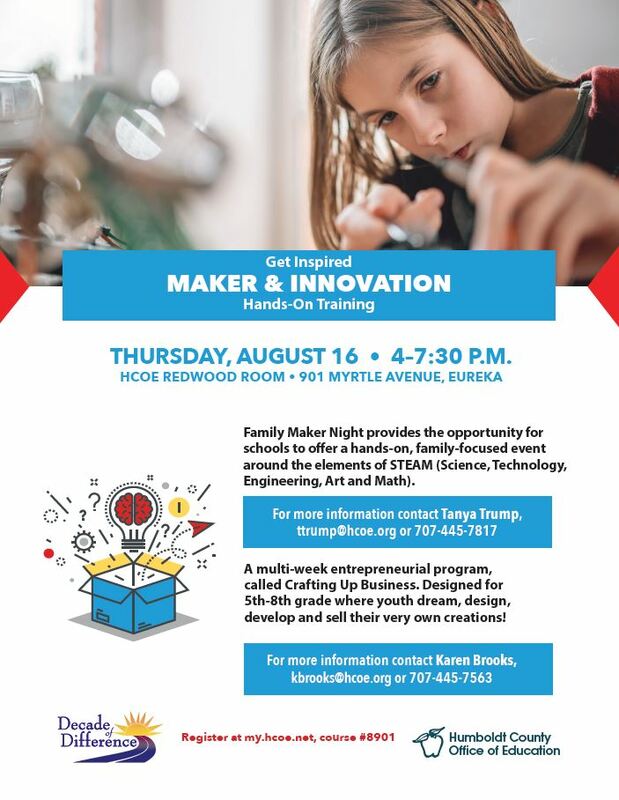 Cost: FREE, however participants will be asked to volunteer at the September Family Maker Night on 9/20 in the Sequoia Conference Center at HCOE.